It is a striking contrast from the cool, misty town of Dalat high in southern Vietnam’s central highlands — built by the French as an escape from the sweltering heat and humidity of Saigon to the glittering seaside resort of Nha Trang, which is barely a three hour drive away. Leaving Dalat in the cool of the morning, we wound our way down through the forests and sub-tropical jungles of the Truong Son mountain range. We passed endless villages and small towns — all a hive of activity — before finally hitting the coastal lowlands and the warm sea breezes of the East Sea and Nha Trang Bay. Nha Trang, at first look, is certainly a touristy beachside holiday town with its wide seaside boulevards, high-rise hotel towers, tourist shops, flashy bars, restaurants and streams of motorbikes and cars. The hustle is only exacerbated by the heat of the day and thousands of holidaymakers. But this is a resort town Vietnamese-style, where more than a millennium of history, culture and tradition combine with hectic local markets, night food stalls and a myriad of small family-run restaurants and cafes. These generate an atmosphere way beyond that of your typical Western beachside destination. 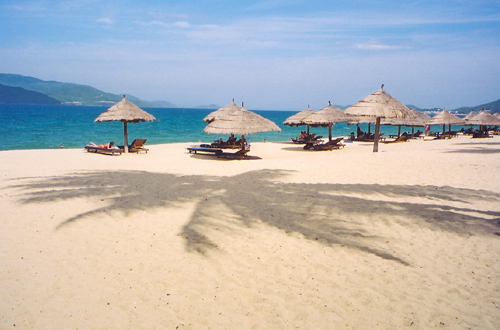 Nha Trang is certainly a town to shop, to eat on the streets and to wander, soaking up the atmosphere along the way. It is also very friendly; the locals busy making a living and getting on with life as fast as they can, after enduring so much turmoil in their recent past. For shopping head for the Cho Dam central market near Nguyen Hong Son Street, which is a maze of stalls stacked with brand name bags, shoes, jeans, leather, silk and plenty more, and a place where bargaining is the name of the game. Nearby is the busy Phan Boi Chau Street, full of shops, and lined with colonial-style shuttered houses. It is this constant juxtaposition of the old and the new — from colonialism to ancient temples, to modern Vietnam, that makes the place so interesting. It all fits in together nicely. Perched on a hill overlooking the city, Xong Bang Bridge and the vast Cai River estuary, is an incredible temple complex known as Cham Pongar that dates back to 700AD. 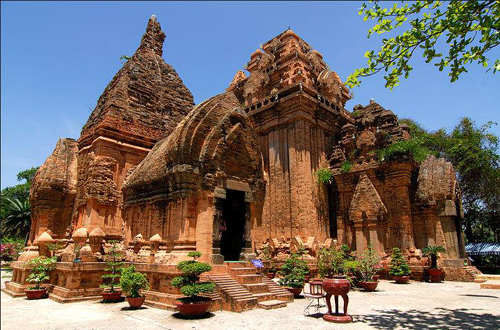 The four temples, intricately carved, are dedicated to the gods and are a place of pilgrimage for many Vietnamese; the chanting of monks and incense filling the air. Families, couples and school children all come to pay homage and pray. Below, in the Cai River estuary, Nha Trang’s traditional wooden blue fishing boats, trimmed in red, line the shore. Nha Trang, at its heart, is a fishing village and the boats still head out daily in their hundreds to the East Sea — their catch filling restaurant plates every evening. In the dark of night you can see their lights twinkling way offshore. Unlike Thailand, there isn’t a huge massage industry in Vietnam, but one excellent way to relax is a soak in the mineral and mud baths of the Thap Ba hot springs. And for a group all in a hot mud bath together, it is loads of fun — though rather intimate. The bubbling mineral water is 40 degrees and rich in sodium silicate while the mineral mud — a glorious thick, hot brown — stimulates the nerves. And yes, you do feel bizarrely rejuvenated when you finally wash it all off. Nha Trang is, of course, changing. On the way to the airport the big Western-style resorts are now gaining a foothold. But hopefully, with so much imbedded history and culture, Nha Trang will not lose that individuality that makes it so attractive.